Nova wants to keep her customers safe by helping them replace dangerous electrical wires on the Singer Featherweight 221. Many of these machines originally had aluminum wiring which is dangerous. Refer to Nova's Tip of the Month from January 2015 to determine if your machine has aluminum wiring. The electrical wiring set that Nova uses to replace deteriorated or damaged Featherweight wires has plugs built-in for both the wall outlet and the machine. If this is fine with you, there is no service fee for Nova cleaning, inspecting and installing this wire set. If your current wiring has the original Bakelite "S" plug that goes into the machine, Nova can install your "S" plug on the new electric wire set for you. The difference in price is the labor charge for installing this plug. If you are missing the original Bakelite "S" plug that goes into the machine, but would like to have one, Nova can provide that plug and install it on the new electric wire set for you. The difference in price is the labor charge for installing this plug, and an original "S" plug. With any of the above options, if you will mail your foot controller (wrapped securely in bubble wrap) it to Nova (PO Box 1307, Hughes Springs, TX 75656), she will clean and inspect its interior and install the new electric wires for your machine. She will even install a nice cord wrap for you. 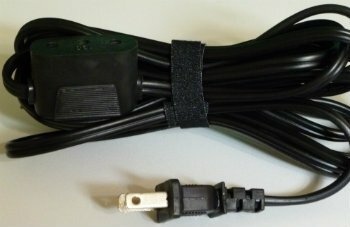 If you are an international customer, due to the costs of shipping the foot controller, Nova will ship you just the wire set of your choice. The advantages of the original Bakelite "S" plug are that it looks 'authentic' and it plugs and unplugs from the machine a bit easier than the built-in plug.
" Nova, Thank you so very much for replacing my cord and plug. It works perfectly..." Carolyn B.